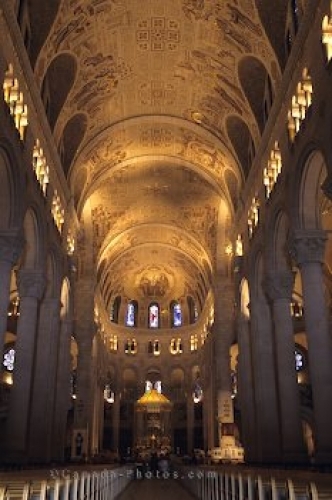 The high arched ceiling and the large pillars are just a small sample of the fascinating interior of the church of Sainte-Anne-de-Beaupre in Quebec, Canada. The interior of the Sainte Anne de Beaupre Church in Quebec, Canada is very ornate and beautiful with the stunning architectural design, stained glass windows and soft lighting. Millions of visitors and pilgrims venture to the Shrine of Sainte-Anne-de-Beaupre on a yearly basis where they can tour through the interior of the church or spend some time in prayer. Picture of the stunning interior of the Sainte Anne de Beaupre Church in Quebec, Canada.